Preface. Introduction (R.W. Cahn). Thermodynamics and kinetics of metastable phase formation (Keiichi N. Ishihara). Rapid solidification (H. Jones). Mechanical alloying (C. Suryanarayana). Laser processing (Kojiro F. Kobayashi). Thermal plasma processing (P.V. Ananthapadmanabhan, N. Venkatramani). Spray forming (Bing Li, E.J. Lavernia). Ion mixing (B.X. Liu). Physical vapor deposition (J.S. Colligen). Chemical vapour deposition (F. Teyssandier, A. Dollet). Combustion synthesis (S.B. Bhaduri, S. Bhaduri). Nanostructured materials (C. Suryanarayana, C.C. Koch). Powder consolidation (J.R. Groza). Bulk amorphous alloys (A. Inoue). The rapid technological developments during the later half of the 20th century have demanded materials that are stronger, capable of use at much higher temperatures, more corrosion-resistant, and much less expensive than those currently used. These demands become even more significant on the threshold of the new century and the millennium. 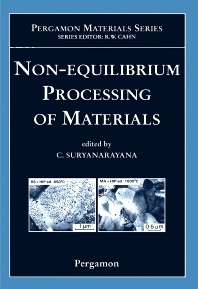 Significant improvements in properties can only be achieved by processing the materials under far-from-equilibrium (or non-equilibrium) conditions. Several new processing technologies have been developed during the past few decades including, rapid solidification, spray forming, mechanical alloying, ion mixing, vapor deposition, laser processing and plasma processing. Remarkable advances have been made in recent years in the science and technology of these processes used to synthesize, characterize, and apply these materials processed under non-equilibrium conditions. Some of these techniques have evolved from laboratory curiosity to commercial-scale manufacturing in just a few years. In other cases, industrial necessity prompted development of the technology, and the science followed later. The chapters in this book have been written by people who are world-recognized experts in their respective fields. Each chapter describes the principles, processing techniques, special features of the materials produced, and their applications. An extensive list of references is provided at the end of each chapter that will facilitate location of additional information on specific aspects of any technique. For graduate level students of materials science and engineering scientists wishing to enter this area of research . Professor C. Suryanarayana received his B.Sc. degrees in Science from Andhra University, Waltair, the B.E. degree in Metallurgy from the Indian Institute of Science in Bangalore, and the M.S. and Ph.D. degrees in Physical Metallurgy from the Banaras Hindu University in Varansai, India. He was a faculty member at the Banaras Hindu University for 23 years and was a Senior Scientist/Visiting Professor at Oxford University (UK), Atomic Energy Establishment, Mol (Belgium), Tohoku University, Sendai (Japan), Wright-Patterson Air Force Base in Dayton, OH, Washington State University in Pullman, WA, and Chungnam National University in Taejon (Korea). Before joining his present position at the Colorado School of Mines, he was a Professor of Metallurgy and Associate Director of the Institute for Materials and Advanced Processes, University of Idaho, Moscow, ID. Professor Suryanarayana has published more than 250 technical papers in the areas of rapid solidification, mechanical alloying, innovative synthesis/processing techniques, metallic glasses, quaiscrystals, and nanostructures and has authored/edited 10 technical books. The most recent one was an undergraduate textbook on "X-Ray Diffraction: A Practical Approach" being published by Plenum Publishing Corporation. The major emphasis of his research investigations has been on synthesis-structure-property relationships. He extensively makes use of transmission electron microscopy and x-ray diffraction techniques for materials characterization.